The timing is for pressure cooker or Instant Pot. 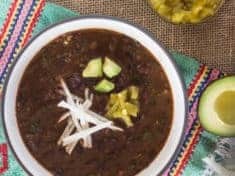 This spicy black bean chili with hearty greens will rock your chili world. You will totally love how the greens balance the already vibrant flavors of this nourishing vegetarian chili. Makes about 8 servings. Add the onions and garlic. Sauté, stirring occasionally until the onion is soft, about 10 minutes. Add the chili powder, cumin, and oregano, stirring to mix into the onions. Add the water, soaked beans, chipotle oil, green chiles, and salsa. Lock the lid in place and cook on high pressure 13 minutes. Quick release the pressure. Stir in the greens and cook about 5 minutes, until they shrink and disappear into the beans. Stir in the vinegar. Taste, adding salt to your liking. Serve with your choice of garnishes, vegan or the optional cheese and sour cream. In a blender puree the chiles with the oil until smooth, adding a bit more oil, if needed, for a smooth paste. Reserve in freezer to use as desired. For regular stove-top cooking, be sure to soak the beans beforehand. Keep an eye on the water level as the beans cook, always keeping them covered with liquid. Depending on the age of the beans, cooking time will be one to 3 hours, until the beans are perfectly tender.